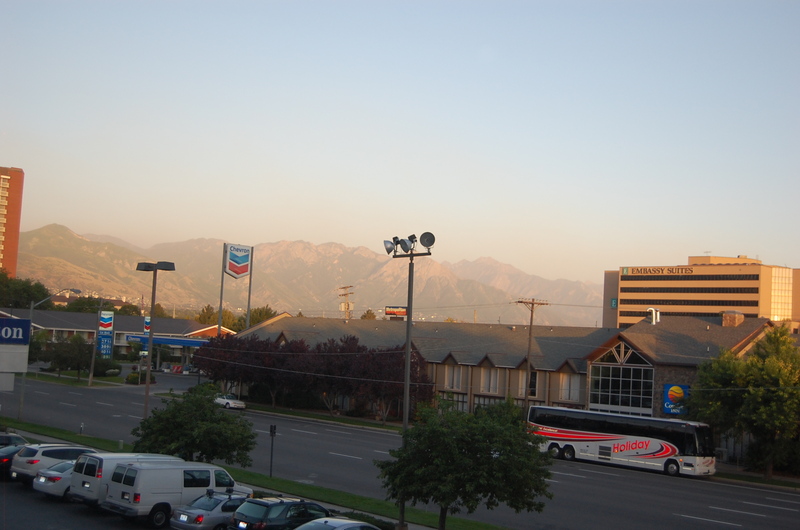 When we left off of the first part of our wrap up, my mom person & Flat Oskar had explored the city and nosed around the hotel, but BlogPaws hadn’t really started yet. When she saw these signs, she knew that both craziness and learning was about to ensue. All though F.O. did wonder why it didn’t say great, small & flat! In the lobby F.O. 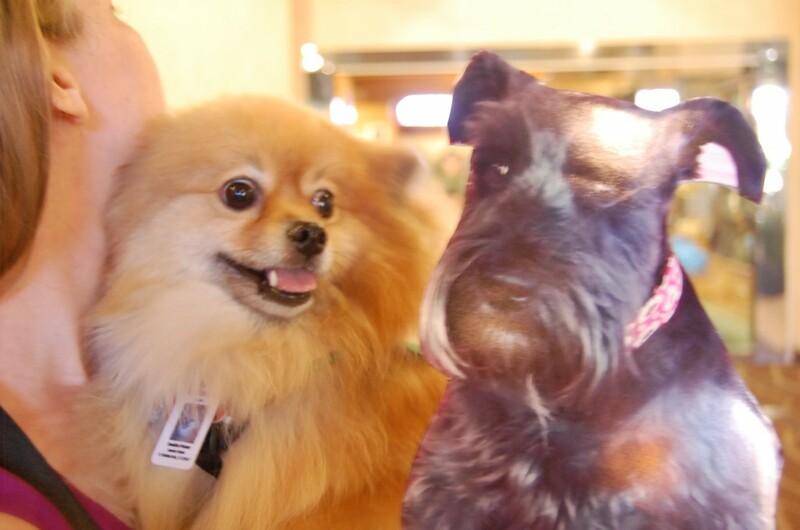 did get to meet one of our great Twitter friends, @PepperPom. She also has a blog called Peppers Paws. 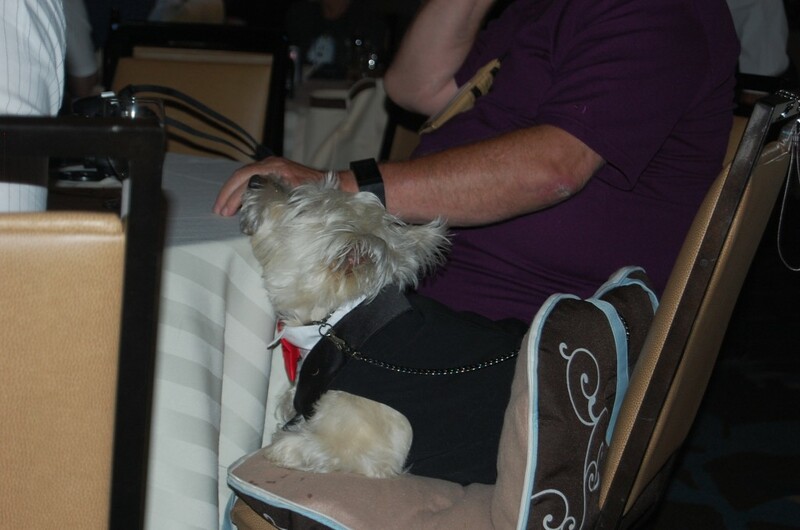 Pepper is a service dog who helps her person. She always has a smile on her face, too. 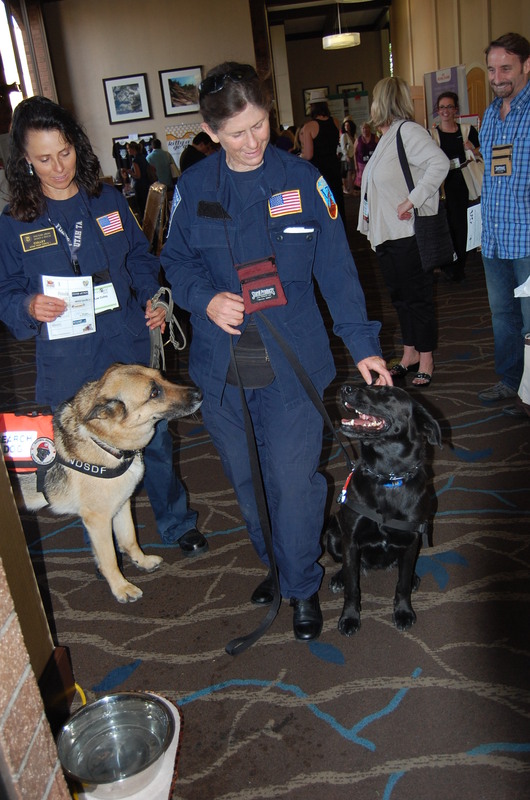 Here are some super-hero doggies with their handlers. They do the very important job of search and rescue. I wish I had been there to shake their paw and tell them thank you for all of the hard work they do. My mom person didn’t get this guys name, but he sure looks happy, doesn’t he? My mom person says all of the doggies at BlogPaws are happy, cause they’re getting so much attention. They do need rest breaks in the hotel room, though cause it’s a whole lot of stimulation to throw at a dog in one short weekend! 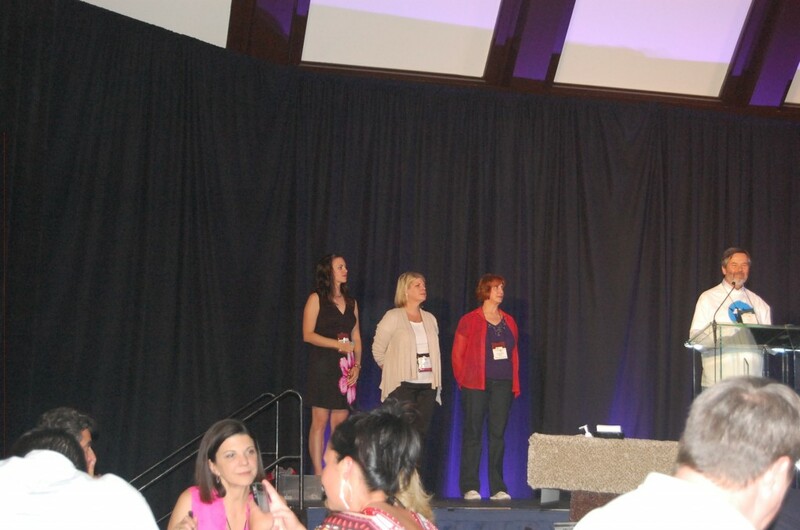 The three founders of BlogPaws, Caroline Golon, Yvonne Divita, Tom Collins, and Tom & Yvonne’s daughter Chloe who’s the COE, or Chief of Everything. 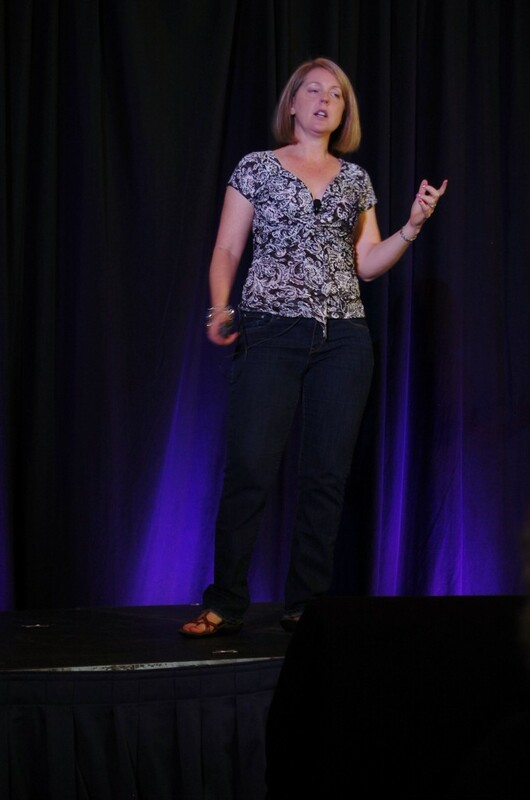 Betsy Saul, the co-founder of the amazingly successful Petfinder gave a great Keynote Address about the way we look at shelter animals, they way they should be treated, and the more controversial topic of is no-kill shelters really are always the best thing. This lady knows her stuff! Now in the middle of this great speech, a group of crazy people who had secretly been practicing for months, broke out into a flat pet flash mob. Yes, my mom person was one of them waving Flat Oskar around like a maniac. 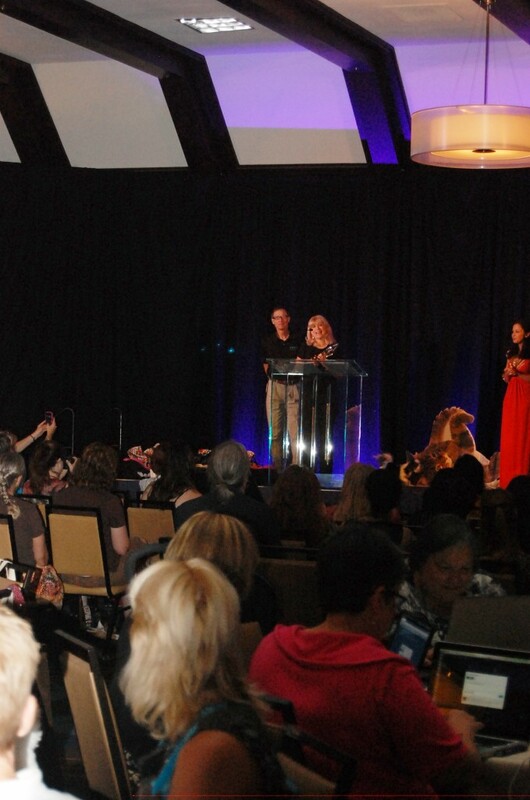 If the video doesn’t work, you can see it on YouTube as BlogPaws Flashmob. Don’t worry, Betsy wasn’t offended, she was in on the whole thing. 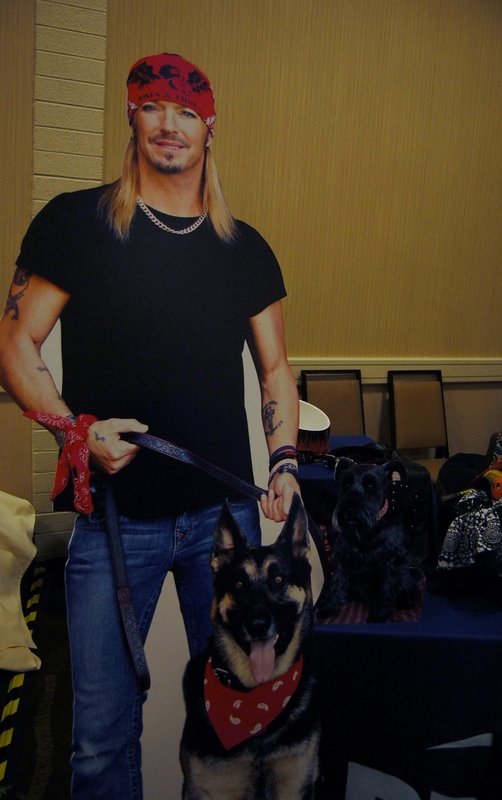 We flat pets were in the company of celebrity, as there was a flat Bret Michaels there to promote his new line at Petsmart. Flat Oskar is in the picture, but you can’t really see him. Too bad, there haven’t been quite enough pictures of him, BOL! Next we’ll head over to the Catification Lounge, designed by Modern Cat and the Cat Daddy himself, Jackson Galaxy. Pretty fancy stuff for the kitties, huh? The really cool thing is that the gave everything away to the attendees on the last day of the conference. 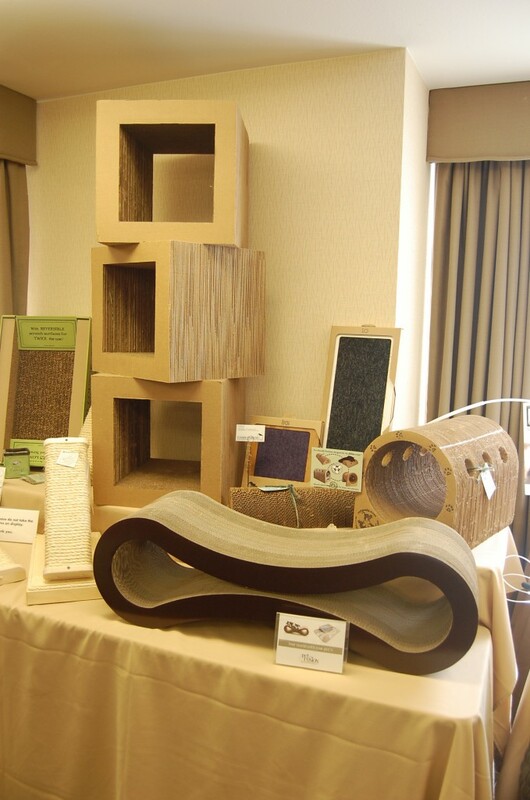 My mom person won a Sunny Seat, but since we already have one for Chloe & Moe, she was able to trade with a nice lady for a sisal and wood scratching post. 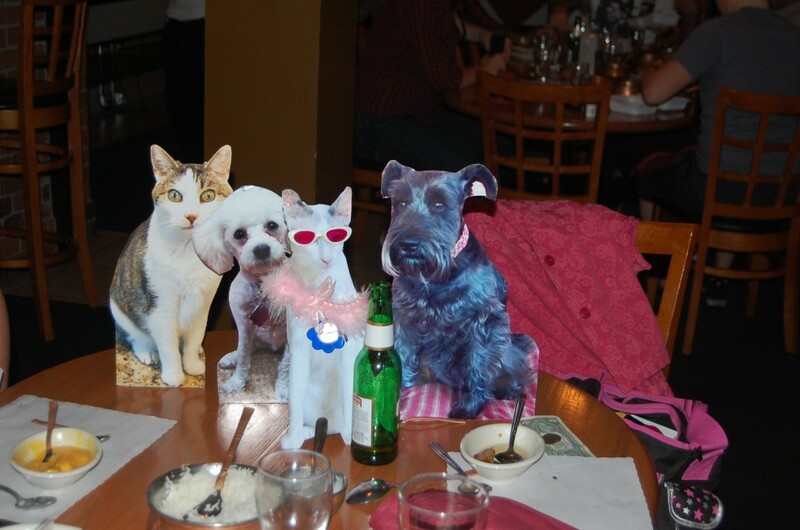 My mom person got to go out to dinner with some of her human friends who are behind some really great blogs. Of course they took the flats & Flat Skeezix had to order a beer. Here’s my mom person & her friends. 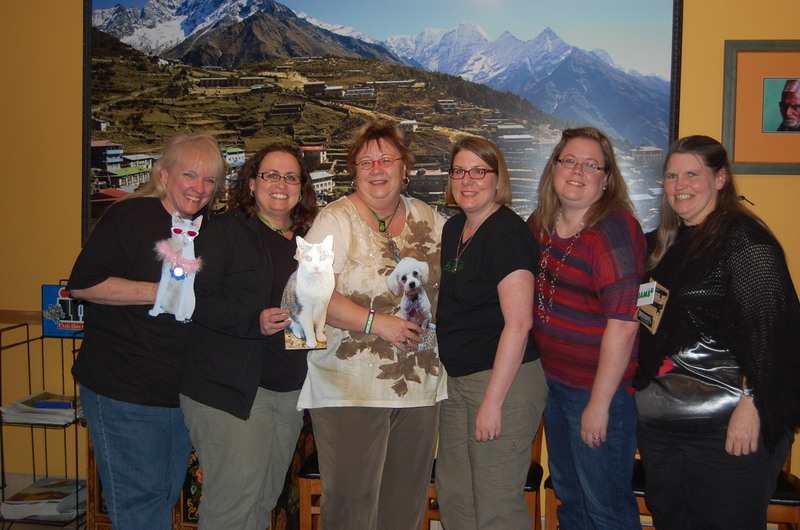 From the end there is Miss Karen from Skeezix the cat & Mousebreath, Miss Joanne from The Tiniest Tiger, Miss Bev from My Fire Hydrant, my mom person, Miss Rachel from Preston Speaks, and Miss Lorie from Social Media Savvy Pets and Pet Health Care Gazette. 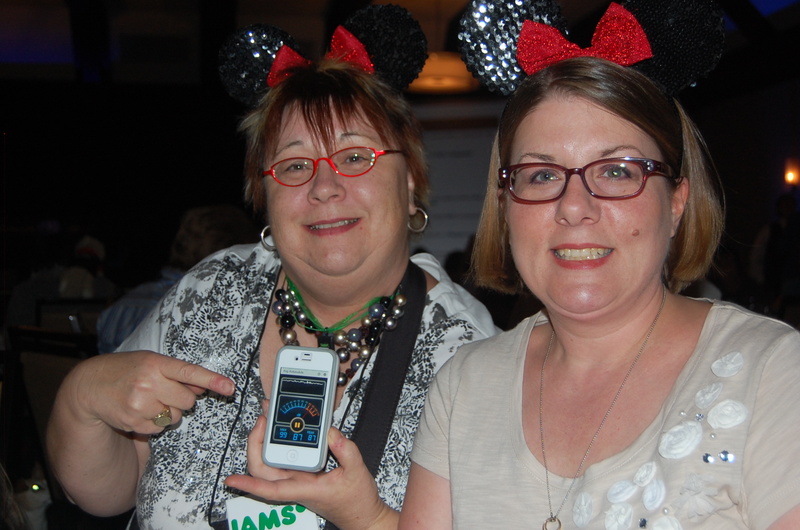 Here’s another picture of Miss Bev & my mom person wearing their silly sequined Minnie Mouse Ears to the formal event. Miss Bev is holding up her iPhone which is measuring the sound decibels in the room. My mom person says it was loud! 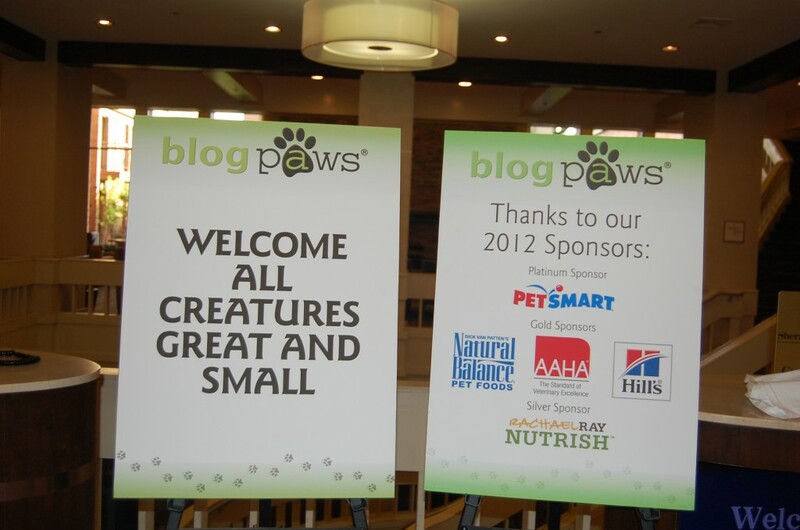 They had their dressed up ears on, cause it was time for the first annual BlogPaws Nose-to-Nose Social Media Awards. My mom person knew lots of people who were up for awards, and lots of the winners. Here’s Paris & John who created & run Dogtipper.com & Cattipper.com. They won the award for Best Bark Blog. This little guy looked like my mom person felt at the end of the weekend…all tuckered out. she flew back home to me! 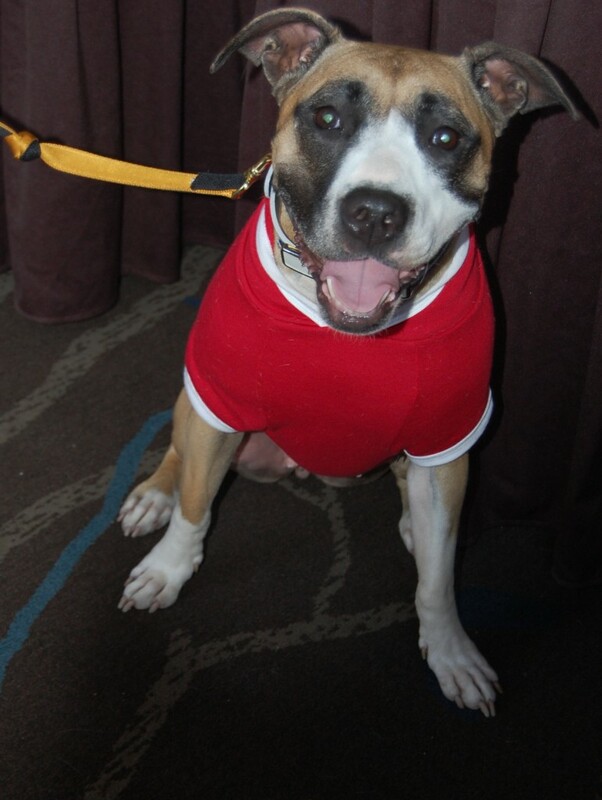 So we’re done with BlogPaws, until next year in Tysons Corner, VA. She can’t wait for the fun to start all over again! Wow! Flat Oskar really has some great dance moves! All the dancers were really Pawsome!!! Mollie recently posted..We’ve got the A-TEAM coming in! Wow, that looks like so much fun! Flat Oskar was in the middle of everything! Casey the Boxer recently posted..Austin Pupdate! great job!!! I just tweeted it and shared it on Dakota’s facebook page!!!!!!!! Furry good repurrt, Oskar! Your hu-man got some really good pix, too! See you in 2013! What great pictures and wonderful video. M felt like she was right there with you. Thanks so much for sharing. She really wishes she could go. mariodacat recently posted..I Love Company! First of all, your new blog is adorable, I love the new look as well, very modern!I miss you so much dear friend, so nice to be here visiting you. Thanks for sharing this article and pictures, what a nice event there and your friends are cute. Looks like a great time! At least Flat oskar got to go. Oh boy your Mom can move!! Dance, Oskar, dance!! Looks like such a fab time! We wish we could have joined your mom and your flatness at the event. Looks like LOTS of fun! Wow, terrific report, Oskar! 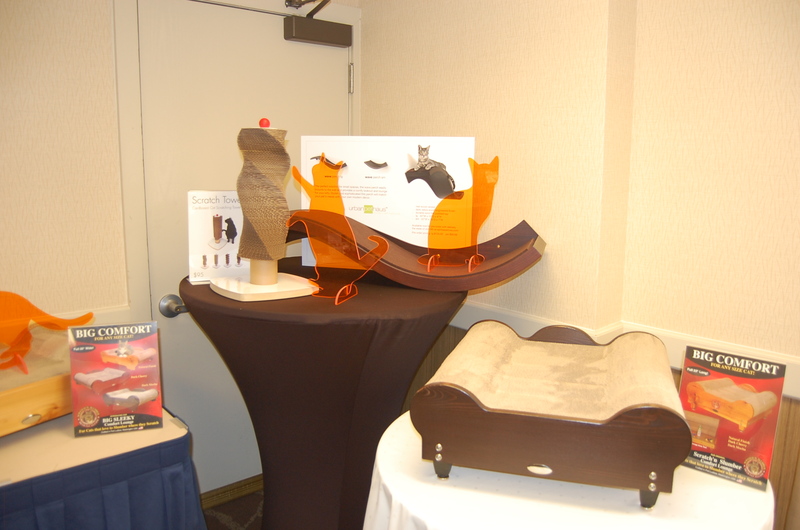 They don’t do BlogPaws here in Canada (that we know of), so it was really cool to see all the photos. Looks like your person had an awesome time! Tysons Corner—-that’s HER old stompin’ ground. Yes the sign should have said Great, Small and Flat. What a fun time and what great pictures! More great pictures. I think even flat Oskar had a good time! Bassetmomma recently posted..Monday Mischief – Or Not? Oskar, your Mom sure had a fun time. I bet you are glad she is home with you now. I hate when my Mommy goes away. p.s. I have to get a haircut tomorrow, can I come over and hide?? Sasha recently posted..Do we have a ghost?? Great recap and what fun we had and so much learning. Nice to meet you and see you in 2013! !